272 pages | 5 B/W Illus. Lively debates around property, access to resources, legal rights, and the protection of livelihoods have unfolded in Vietnam since the economic reforms of 1986. Known as Doi Moi (changing to the new), these have gradually transformed the country from a socialist state to a society in which a communist party presides over a neoliberal economy. 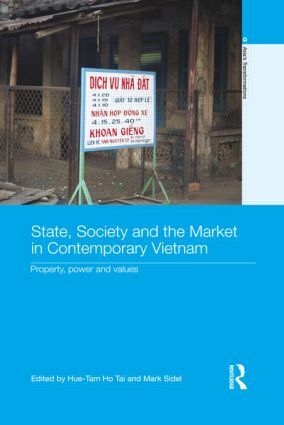 By exploring the complex relationship between property, the state, society, and the market, this book demonstrates how both developmental issues and state-society relations in Vietnam can be explored through the prism of property relations and property rights. The essays in this collection demonstrate how negotiations over property are deeply enmeshed with dynamics of state formation, and covers debates over the role of the state and its relationship to various levels of society, the intrusion of global forces into the lives of marginalized communities and individuals, and how community norms and standards shape and reshape national policy and laws. With contributors from around the world, this book will be of great interest to students and scholars of East and Southeast Asian studies, including politics, culture, society, and law, as well as those interested in the role of the state and property relations more generally. Hue-Tam Ho Tai is the Kenneth T. Young Professor of Sino-Vietnamese History at Harvard University, USA. Mark Sidel is Doyle-Bascom Professor of Law and Public Affairs at the University of Wisconsin-Madison, USA.